Dani Keller wakes up one morning to find her husband, Ian, has disappeared. If this sounds like a familiar theme (aka “Gone Girl”), Deb Caletti’s psychological thriller – He’s Gone – will surprise you with its gripping narrative that is different – and with a surprise ending that is satisfying. As the tale unfolds, the lives of Dani Keller and her choices of men become the catalyst for the mystery of her second husband’s fate. Having escaped her physically abusive first husband, Dani finds that her second husband is obsessed with control and not the soul mate and rescuer she had imagined. When he mysteriously disappears, she may be grateful – but did she kill him? With clever revelations of past and present lives, Caletti keeps you guessing until the end. As a National Book Award finalist for her teen story,”Honey, Baby, Sweetheart,” a coming of age story of a teenage girl with a rebel boyfriend and a mother who is a librarian (that I now have on my to-read list), Caletti is well known for her young adult novels. He’s Gone is her first adult novel. A fellow reader alerted me to this book, and I read it in one sitting – just had to know whodunit – fun and engaging. 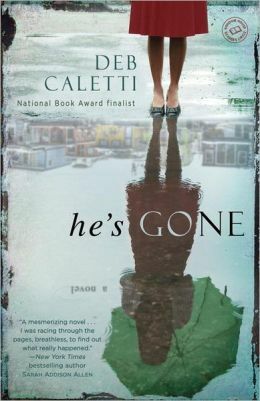 This entry was posted in authors, book review, books, mysteries, reading and tagged abusive husbands, Author, Book, Caletti, Deb Caletti, Fiction, He's Gone, National Book Award finalist, psychological thriller, relationships, young adult author. Bookmark the permalink. I have this book on my to-read list. I’m glad to see another recommendation for it. I really liked it – hope you do too.